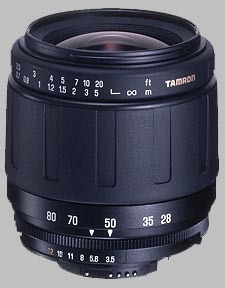 (From Tamron lens literature) A standard zoom lens from a wide 28mm to a medium telephoto range of 80mm. The use of aspherical elements in the front group reduces the number of elements required, and the use of strong engineering plastic in the barrel makes the body a light 237g. Consequently, it is easy to carry. light, small, rugged, good sharpness and color...and have I mentioned, "cheap"? I'm giving it an 8 rating across the board simply because I don't want to seem like I'm overselling the lens. But good grief this lens does everything that I really need it to do. It's sharp (and quite sharp) across the frame at F8-F11 maybe even F13 at least on a film camera, which is pretty-much what I'd expect from most D/SLR lenses. I'm shooting it on a Nikon N80 which I picked up on eBay for $25, bought this on eBay for $40, got a multicoated UV for it for $8.50. The combination is not fast, doesn't have an ultra-wide or even medium-long zoom, doesn't even have IS, but boy does it take nice landscape pics with ISO200 film handheld even after the sun goes below the horizon. *Plenty* of speed in anything resembling decent light. I can't say much about the bokeh but if that's not really your bag this lens is just fine especially for the price. The *most* that I've seen it for is $80 retail. Another "winner" from Tamron, just goes to show that a basic lens, done right, really doesn't have to be all that big, heavy, fast or expensive to perform well. Just don't ask me how well it works in a rainstorm. This is a light weight, cheap lens. It is slow, and not too great on the zoom range, but the cost and weight of the lens make it good for carrying the camera around to shoot snapshots when you don’t want to drag around a heavier lens. The lens works well on both film and digital cameras, and is good for general shooting. It comes with the lens caps and a lens shade. Since the manual focus ring is a bit on the narrow side, I often find that I focus it with the lens shade on the FM2. I don’t use this lens too often, except when weight is a consideration and I don’t expect to need a longer or faster lens.